Avg. Group Discount of 57.0%! For comprehensive programs of 10 to 3200 people or individual events as large as 5,400, Caesars Palace's meeting facilities feature an elegant Imperial Roman design and overlook the lush Garden of the Gods Pool Oasis. With 240,000 square feet of flexible space, the multi-room, dual-level meetings complex is state-of-the-art with the latest in audio/visual capabilities, computer link technology, and video conferencing. Coffered ceiling offer superior sound, and all ballrooms feature fiber optics and coaxial cables. The Caesars Palace Events Center offers 49,000 square feet of unencumbered space with 60-foot ceilings, and is ideal for everything from exhibits to gourmet group dining. All of the Ceasars Palace guest rooms and suites are a short walk or elevator ride to the Conference Center, restaurants, gaming and shopping. Spacious and beautifully-appointed, rooms may include luxurious marble bathrooms, elegant armoires, and sitting and desk areas. Every room is fully equipped with a safe, high speed Internet access, iron/ironing board, and a hair dryer. 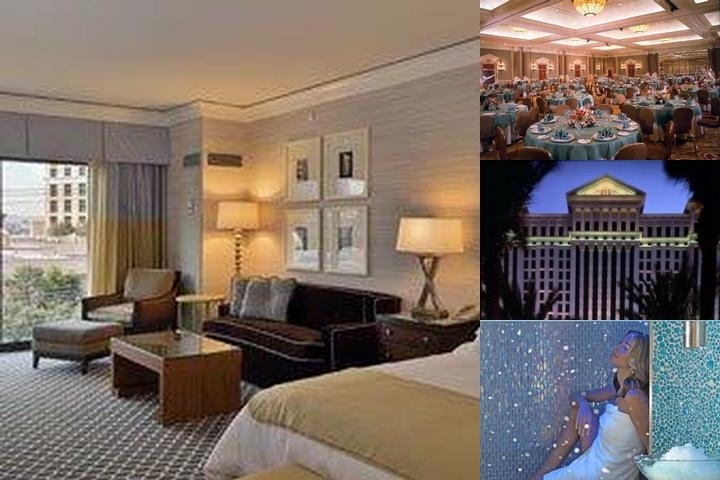 Elegant accommodations, fine dining featuring an array of cuisines, high-stakes gaming, world-class shopping, and legendary entertainment and special events have made the Caesars Palace name internationally renowned for nearly 40 years. Pools usually open around 9 a.m. and close at 6 p.m., just before sunset. Pool clubs, like Venus Pool Club at Caesars Palace and The Voo at Rio tend to open around 11 a.m. - noon. Cancellation policy is 48 hours in advance. 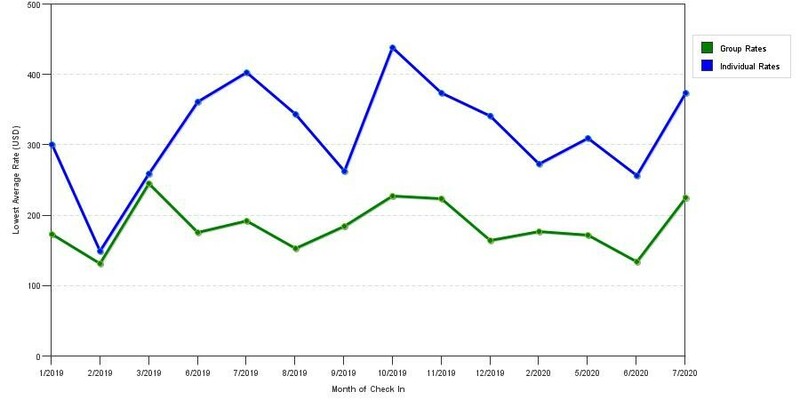 The chart above shows seasonality of prices for both group/meeting quotes and the best individual traveler rates our rate checker could find at the time the group/meeting offer was entered. The most competitive group deal shown is 60.8% in July 2019 and the highest average individual rate is $625 in the month of November 2019. This chart will show past seasonality and also project future months. If you are flexible with dates, you may want to consider staying at Caesars Suites at Caesars Palace in a month when rates are lower.